REVIEW: 'Faith' #5 (Election Special) by Jody Houser, Louise Simonson, Rafer Roberts, Meghan Hetrick, et al. 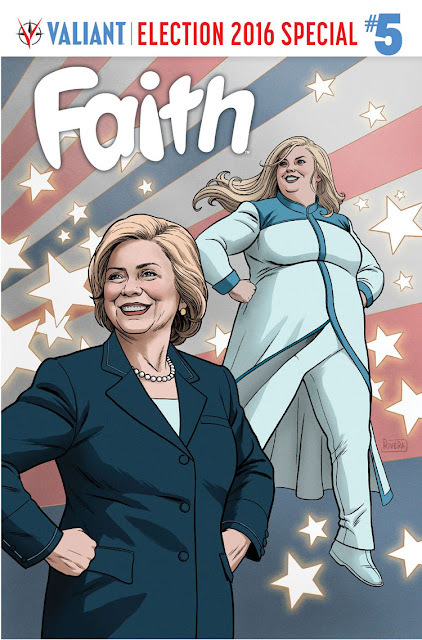 I have to preface this review by saying that despite the cover, Faith #5 is not a heavy-handed politically biased edition. It would be easy to prejudge this issue under this polarizing election climate but Faith extolls the virtues of making your voice heard through voting, no matter who your candidate may be. This is also a super-sized issue consisting of three different stories with three creative teams. All for the price of a regular issue. "Dark Star" by Jody Houser, Meghan Hetrick, Andrew Dalhouse and Marguerite Sauvage introduce the story of a former child star ruined by scandal out for revenge while under the influence of a dark magical cat. Imagine Sabrina the Teenage Witch's cat, Salem, using mind control on the fragile psyche of a young girl to wreak havoc in town. Hetrick does Faith justice with her penciling style that is playful and expressive, not too far removed from series artist, Pere Perez. Series colorist Dalhouse adds colors that pop for Faith and the girl, Zoe. Sauvage's signature flashbacks are always joyous and colorful through a collage of scenes. "Faith in Politics" by Louise Simonson, Pere Perez, and Dalhouse finds Faith on assignment covering presidential candidate Hillary Clinton's political rally at the Los Angeles Coliseum. It's more about the importance of casting your vote and about what makes our democracy great than Clinton specifically, although she gets a cameo. There's also a psiot in the middle of a heist nearby that causes Faith to prioritize her duties as a reporter and that of a responsible superhero. She almost utters that famous line about what comes with great powers. Again, 'Faith' addresses the heart of what makes a hero a hero through self-doubt and humor. Even more so in the next story. With the regular art team on this section of the book, Perez's clean lines and Dalhouse's brightly-colored palette gives us readers what we're used to and love about the series. It's an action-packed self-contained story that teaches Faith a lesson and encourages participation in our democratic system. "No Days Off" by Rafer Roberts, Colleen Doran, and David Baron begins as a straight-forward crime fighting scene that evolves in a deeper heart-warming rescue involving a young psychic girl. Despite being on patrol long hours Faith finds the strength and inspiration to keep going as a tireless hero. She continues to learn about herself and what drives her to be a better person. It's not something that gets explored very often, the impact of heroes on other people, as role models to kids and kids with emerging superpowers within comic book stories. Faith is self-aware and it brings her joy to know that all her work makes the world better. She's all about being positive and fighting for justice and her enthusiasm is infectious. So many people complain about the lack of inspirational heroes. They haven't read 'Faith' or else they'd know better. 'Faith' continues to be one of the best comics in the business. It's unapologetically optimistic and heroic with an affable and endearing lead like Faith Herbert. It doesn't matter what your politics are if you want great superhero storytelling that puts a smile on your face this is the book for you.